Kitchen remodel mistakes to avoid. Tackling a kitchen remodel requires a lot of patience and money. There are big decisions that need to be made and you don’t want to find yourself having buyers remorse after the remodel has been completed. To have a rewarding kitchen remodeling experience, there are few things you should consider avoiding. It’s important to have a plan before you start knocking down walls all willy-nilly. Disregard any inspiration you have seen on home improvement shows or frustration with the way your current kitchen looks and feels. Avoid being impulsive with major decisions like ripping off surfaces because you think that will be the solution to all your kitchen woes. It’s a tempting move but could cost you an arm and a leg in the end to correct any mistakes. That’s why patience really is a virtue when remodeling a kitchen. Stick to the plan set out and you can avoid astronomical costs and save time in the process. your time and wallet may seem to be leading you to do the bare minimum required to update your kitchen. 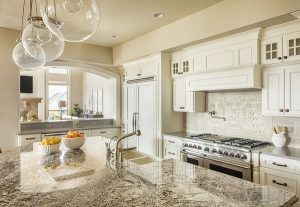 However, if you have found yourself always harboring issues with your kitchen and it’s layout and design, then simply installing new countertops and nothing else will only bring you temporary satisfaction. Shortly after installation, you will find yourself wanting to update different aspects of your kitchen and falling short of being in love with your kitchen each time. Right now is the best time to think about what exactly your dream kitchen would look like. Think about the changes that would create the most satisfaction for you. It’s best to invest now in the things that would be most practical than to upgrade a kitchen little by little. It’s typically easier to handle construction mayhem all at once instead of in bursts. Doing some work on the kitchen remodel yourself is a great idea for someone who is handy and lacks a full-time job. If that doesn’t apply to you then it’s best to leave the remodeling to the pros. Please remember to be as realistic as possible when you embark on your kitchen remodel journey. Unless you are a world-famous gourmet chef, then fancy kitchen appliances are not going to magically turn you into one. Build a kitchen that satisfies your current needs, not your top chef fantasy needs. This entry was posted on Thursday, January 12th, 2017	at 1:40 pm	. You can follow any responses to this entry through the RSS 2.0	feed. Both comments and pings are currently closed.